Designed for packaging liquid products. 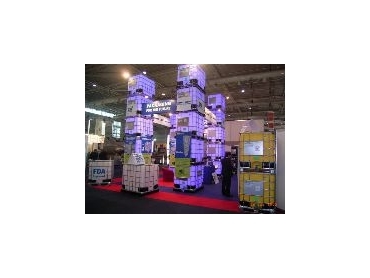 DSL Packaging's stand 366 at AUSPACK will feature the Schütz Intermediate Bulk Container (IBC). The units measure approximately one cubic metre and comprise a heavy duty polyethylene blow moulded inner bottle, surrounded by a steel cage, which is mounted on either a metal, plastic or wooden pallet for easy handling. They are designed for the packaging of liquid products, including food, and are UN-approved for many dangerous goods. One of these IBC holds the equivalent of five 200L steel drums in the space of four. They are reusable and come with a unique, environmentally friendly global collection system. If you are intending to visit Auspack or wish to speak to the DSL sales staff please contact the NSW sales manager Michael Ludemann on 0407 661 697.